Durable and tough fiberglass windows and doors for long-lasting performance. Getting the right advice makes all the difference. Schedule your free expert consultation. Select the available operating style icons above to access product specifications and design files. Operational Style Arch Manuals available by clicking on icons above. Ultra Series windows and patio doors stay true through almost any environment. Because it is made from glass fibers, the frame expands and contracts at approximately the same rate as the insulated glass it holds. This puts less stress on the seals, reducing the chance for seal failure while allowing for a clear, fog-free view. Milgard Ultra™ Series fiberglass window frames come in a palette of rich, designer colors. From warm 'harmony' to bold 'black bean', get inspired with all the possibilities. The Milgard Energy Calculator provides a quick and easy way to help you select windows and doors that can meet local energy codes and project requirements. This tool gives you the flexibility to select the required ENERGY STAR® zone, u-factor, SHGC or VT, and determine which Milgard window and door products meet the selected requirements. Additional selections can also be made based on product series, operating style, glass type, grids and spacer type. 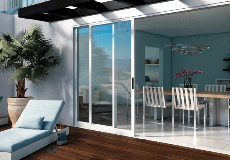 Ultra Series windows and patio doors are designed to be worry-free. In addition to Milgard's standard Full Lifetime Warranty, which includes parts and labor, Ultra Series come with glass breakage coverage for added peace of mind. For as long as you own your home, your Milgard windows and patio doors are covered, parts and labor included. Learn about what it means to have your customers protected and covered under the Milgard Full Lifetime Warranty. Need help explaining a project to a homeowner? Position yourself as a trusted advisor and share our planning tips on 'Where to Start', Who's Involved' and 'What to Expect' with a potential client during your next bid. Milgard windows and doors minimize heat absorption and conduction to maximize insulation and light reflection. In any climate, against extreme weather, our products conserve energy and meet the needs of your project. Milgard understands the importance of continuing education. In conjunction with our partners, we are happy to provide accredited courses for professionals. You can also connect with a Milgard Architectural Rep for a live presentation.